“Each game of chess / Means there’s one less / Variation left to be played; // Each day got through / Means one or two / Less mistakes remain to be made.” These opening lines from “Prologue”/”The Story of Chess” point us to the inevitable—but not predictable—conclusion of Chess, the 1988 American version of Tim Rice, Benny Andersson, and Bjorn Ulvaenus’s 1986 British musical. It’s the current Waterworks Players’ production, finishing its run this coming weekend. Chess’s time and setting is vast—from Budapest to Bangkok, and from 1956 to 1988—and its plot is too shiftily intricate to synopsize, which is as it should be; there are feints within feints as characters’ loyalties change, “players and pawns in a much bigger game” (again from the “Director’s Notes”). The set makes this fluidity beautifully visual. Designed by Blaheta and Tech Director Moffatt Evans, it’s a tri-level marvel that makes great use of Waterworks’ compact space: clean, minimalistic, all black-and-white edges and angles. The chessboard and its players are moved all over the stage, signifying the 24 scene changes in the play—the effect is not unlike actual moves made in chess. Props appear and disappear smoothly, almost invisibly, a testament to Blaheta’s skillful direction and the actors’ hard work. There are wonderful (and vocally challenging) musical numbers throughout Chess, especially “One Night in Bangkok,” as well as crackling exchanges between characters. (Though it’s a musical, this version of Chess, unlike the British version, is at least one-third dialogue). There is intrigue, and the inevitable complications: Why does Florence move from one chess master to the other? Will she, now that she is back in the country of her birth, be able to locate her father? Is he still alive? What price has Anatoly paid for defecting to America? What price has Freddie paid to become who and what he is? Who really controls, not just matches but the international policies behind them? Kudos to the cast. Joe Reiff’s Freddie and Jordan Whiley’s Anatoly are well “matched” indeed; their clashing tenor and baritone, respectively, navigate the challenging score. Jenni Reiff (Florence) is both feisty yet vulnerable; her lyric soprano is best on display in “Someone Else’s Story.” Billy Tucker (as Molotov, Antoly’s manager) and Elijah Logue (as Walter, Freddie’s slick financial agent) are delightfully cynical back-scratchers. Mary Jo Stockton has a poignant turn as Svetlana, Anatoly’s estranged wife. Anna Stinson brings a ferocious determination to her role as the matches’ arbiter, and Christian Huggard is suitably officious as Nikolai, an aide to Molotov. 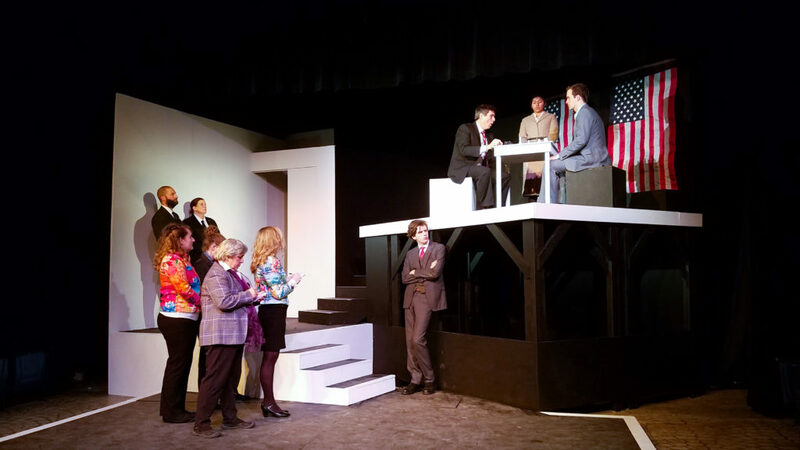 Stinson, Huggard and Stockton also perform multiple roles in an ensemble that includes Kolby Grimsley Logue, Kristen Martwinski, Jeanne Strunk, John Diamond, Chloe Logue, Barbara Wyrick and Maurice Ellis. Kudos as well to the Waterworks production team and crew that have put this challenging show together. They are too numerous to list here, but read carefully the second page of the program. Lighting, sound, choreography, costumes, the aforementioned set, the authentic-sounding Russian and Hungarian accents—all these and more have combined for a magical evening of theatre. The final two performances of Chess are Friday, April 12th and Saturday, April 13th at 8 p.m. You don’t want to miss this one. For ticket information, consult the Waterworks website (waterworksplayers.org) or call 392-3452.